When rioters in Watts, California, began shouting "Burn, Baby! BURN!" in the turmoil of 1965, they were echoing the most popular cry on rhythm-and-blues radio: The trademark of Magnificent Montague, the most exciting R&B disc jockey ever to stroll through Soulsville. In Los Angeles on KGFJ, and earlier in New York on WWRL, Montague yelled "Burn!" whenever he was playing a record that moved him. His listeners followed suit, calling Montague and shouting "Burn!" on the air. The emotion in that exchange reverberated with as much excitement as the music of Stevie Wonder, Sam Cooke and Otis Redding. Now, in his autobiography, to be published in October, 2003, by University of Illinois Press, Montague tells the story of his days on the mike and his simultaneous, hidden life as one of the most passionate collectors of African American memorabilia in the U.S. 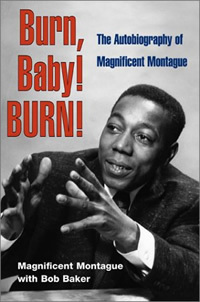 The intertwining of Montague's dual lives makes "Burn, Baby! Burn!" one of the most historically informative books on entertainment and the most entertaining history book around.